Ever since high school I have been a HUGE fan of using TPR (Total Physical Response) to teach a foreign language (shout out to Señor Pluger for introducing it!). Loved it so much that I wrote a research paper on it in college, asked for the book by James J. Asher for my birthday one year (language nerd time infinity), and implemented it in my own classroom. [TPR] is based on the premise that people are biologically wired to acquire a language in a particular sequence. The sequence is visible from observations of how children acquire their first language. Before the child can utter anything more intelligible than "mommy" or "daddy," that individual has internalized a sophisticated understudying as shown when the infant accurately responds to commands as, "Dave, pick up your red truck and put it in your bedroom!" Further, we know that 1/3 to 1/2 of al utterances (Friedlander, 1972) directed at the young child are commands such as, "Don't make a fist when I'm trying to put on your coat!" The book goes on to discuss how commands in a classroom can be a great way to introduce novel vocabulary and grammar in a fun way, in which the students don't feel like they are learning or memorizing language. I can certainly speak to how true that excerpt is. I feel like all I ever do is give Pippa commands - usually of what not to do. "Don't close that door!" "Don't throw your food on the floor!" "Please stop licking that." "Don't pull Mommy's earring." "We don't eat computer chargers." In doing so, I have actually learned some new Spanish vocabulary, myself! Pippa loves opening and closing doors and drawers, so naturally I have had to acquire the words for drawer, cabinet, and pinched fingers. 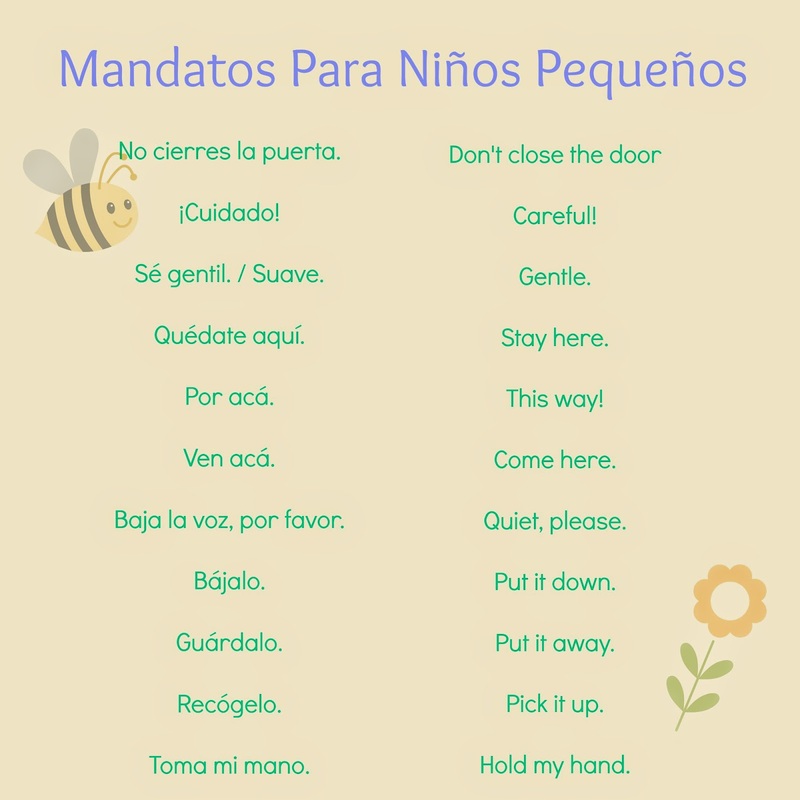 During the crawling/walking/toddler stages, it's really important for a non-native speaker speaking a second language to their child to be familiar with the command forms, as well as common mandates given to your child. That's half of what you'll say to the baby throughout the day! Now I'm just looking forward to the day my commands are less about keeping baby out of danger, and more about playing, helping with chores, and having fun!